Wedge Worldwide has recently added to its selection an excellent new cookbook that was put out by one of our favorite local organic farms. 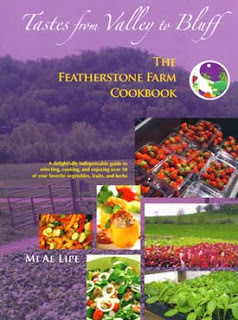 Tastes from Valley to Bluff: The Featherstone Valley Cookbook by Mi Ae Lipe, offers a collection of recipes that beautifully captures the flavors of Featherstone Farm while offering practical info on storing and preparing fresh organic vegetables. Arranged by season, Tastes contains nearly 300 delicious ethnic and traditional recipes, two-thirds of which are vegetarian or vegan. Far more than just a cookbook, Tastes also features fun trivia, witty quotations, beautiful illustrations and many informative, thought-provoking articles about farm life, crop-specific topics and the environmental and nutritional advantages of growing and eating organically. Whether you are a CSA (community supported agriculture) subscriber, a farmers market denizen or simply a home cook curious about what to do with fresh produce, you will truly enjoy and constantly use this book. Part of a good cause, a portion of the cookbook's proceeds will go toward the Sow the Seeds Fund. In August 2007, many farms in southeast Minnesota, northeast Iowa and southwest Wisconsin, including Featherstone, were in ruins after storms and heavy flooding devestated the area. Shortly thereafter, a relief fund was started to help natural foods farmers rebuild. The Sow the Seeds Fund was able to raise and distribute over $385,000 for flood relief, providing assistance to more than 30 farms that applied to the fund. Further, your purchase will do even more to help organic farmers because the Wedge will also donate all profits from the cookbook.